We started preparing the sheep for shearing several days in advance. This being the second wettest year on record, we knew it was essential to make sure the sheep and their wool were dry before shearing. 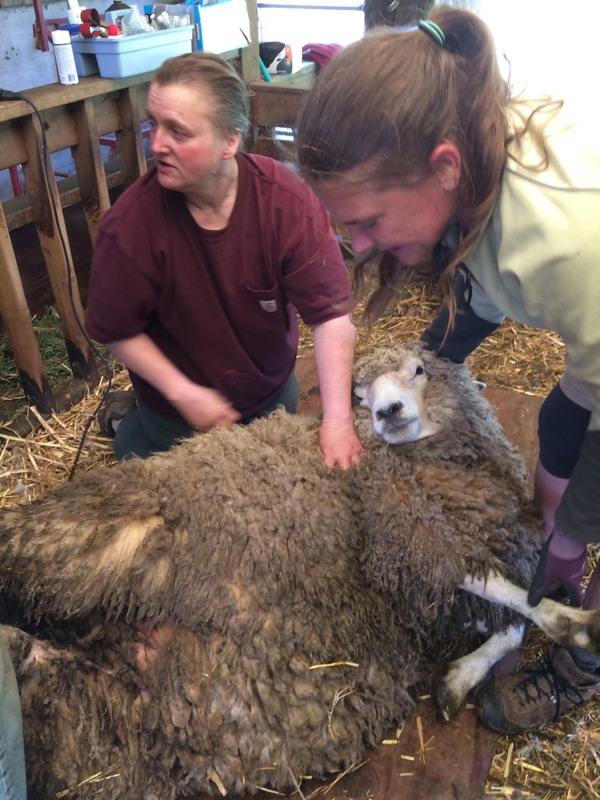 And we knew that the shearing would not be easy because the fleeces are huge and there was mud and other unappealing stuff in the wool, especially at the back end. So we decided to trim hooves and administer dewormer before shearing rather than during the process, and we undertook to clean up the backsides by clipping the area with hand shears. Definitely no one’s idea of a fun activity, but wet poopy wool gums up the electric clippers Beth uses and makes the whole process much more laborious. This year we decided to pen the sheep overnight to keep them dry (yes, it rained after a sunny day) and to withhold food from them. 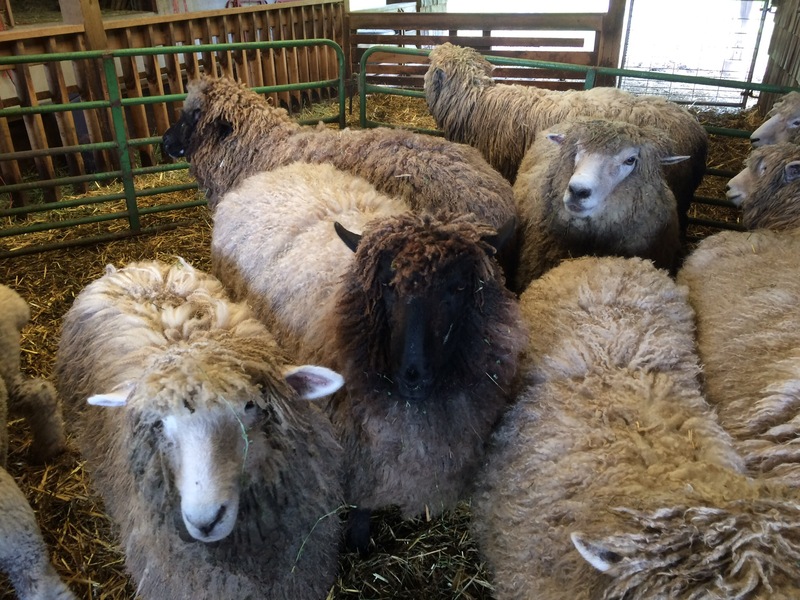 We thought they would complain loudly about this–missing both dinner and breakfast–but instead they all relaxed, laid down inside the stall, and chewed their cud all night. It was a peaceful scene until they saw us and began clamoring for food. Here they are, ready for shearing. If space allows, sheep will run when we approach to handle them, and that creates stress for all of us. Hence the portable gates that pull everyone together into a snug bunch. The shearing area will be set up in the far corner of the stall. 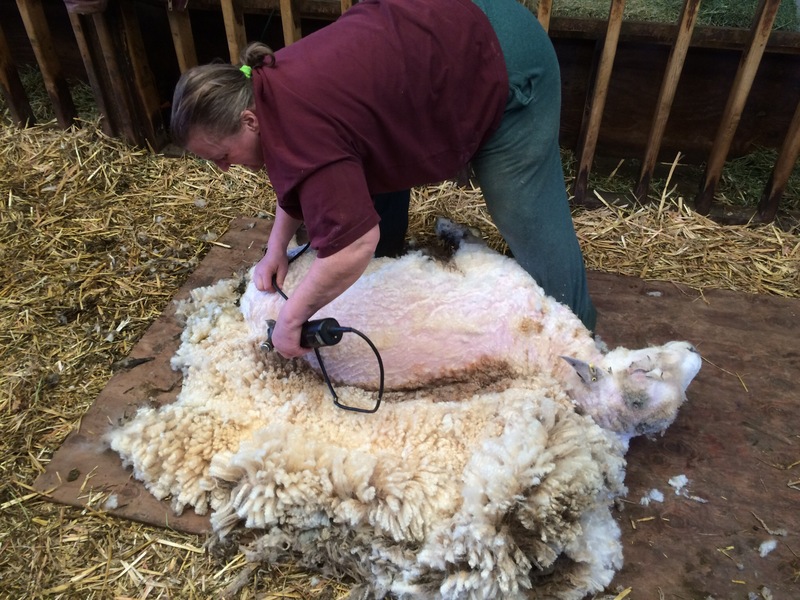 Beth is getting ready to remove over 10 pounds of wool from this ewe. Our daughter Susan (who is also the designer of our website) has come out to help. She grew up on our farm, raised 4-H and FFA lambs, and has a way with animals. It takes two people to bring an unwilling sheep away from her flock-mates to the shearing ‘floor’ (in our case, a piece of plywood). So, two shepherds (John and Susan), one shearer (Beth), and one wool-packer (Marilyn)–I label plastic bags with the sheep’s name and year, grab the obviously undesirable parts of the fleece as they come off and throw them away, then fold up the fleece and stuff it into the bag. In the next photo, Beth has shorn the belly, neck, and head. She is about half done. Next she will roll the sheep over to take the wool off her other side in long smooth strokes. Shearing is not for those with weak backs! Note how lovely the wool looks from the inside. We do not rush the shearing. Between sheep, we discuss the flock and our plans for it, assess the health of each individual, and allow ourselves to rest. After about 3 hours, we have 11 fleeces bagged up and the sheep are ready to go out to the pasture. 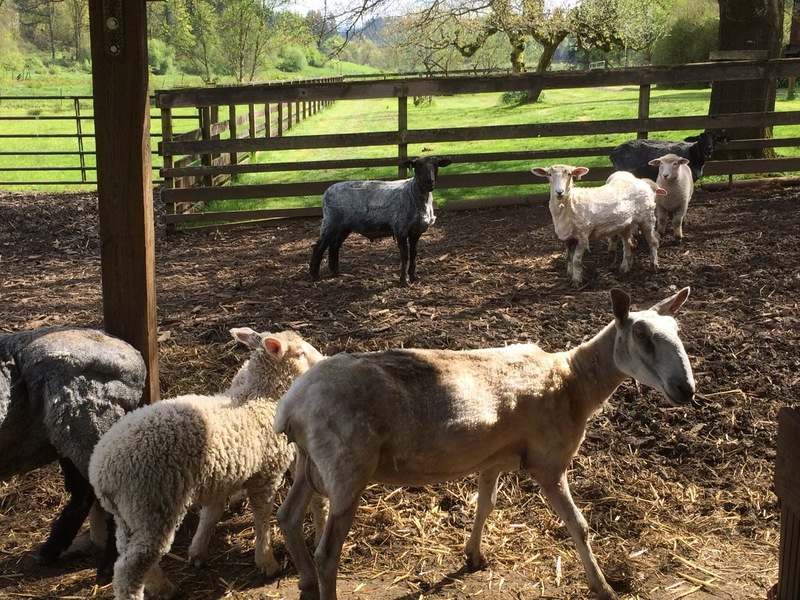 The lambs and mothers have located each other (sometimes a challenge due to the change in mom’s appearance), and I imagine it feels good to have all that heavy wool off. 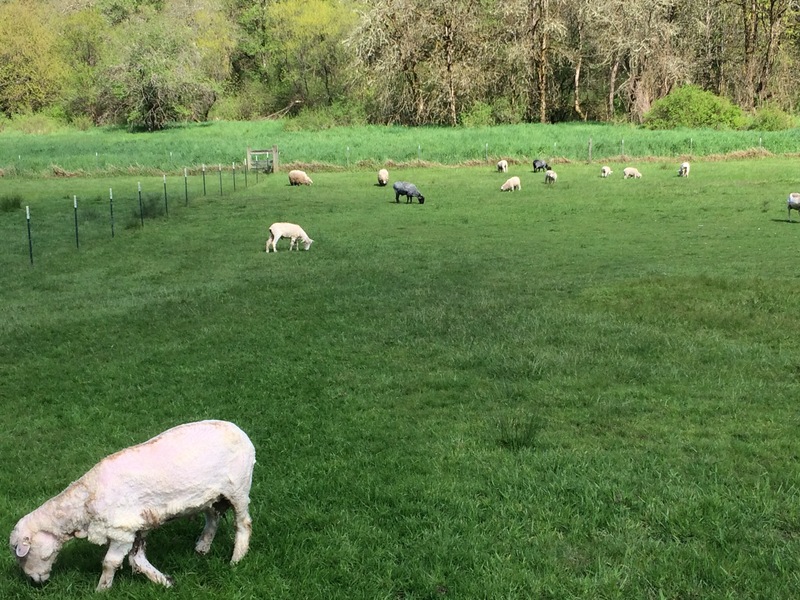 Soon they are out on the pasture, doing what they do best–munching. Now the real fun begins for the fiber artists: sorting, skirting, soaking, and washing the wool.